David Hare’s The Judas Kiss is an intelligent, beautifully written play about Oscar Wilde that provides an insight into the famous character unlike any previous play. The play from 1998 comes to Toronto in the acclaimed 2012 production by Neil Armfield starring Rupert Everett as Wilde. Everett’s brilliant performance alone provides a masterclass in superb acting, but, indeed, the entire cast performs at the same high level. Witty as one might expect, the play is also as gripping as a thriller as we watch a great man see his life head unswervingly toward disaster. The play is in two acts –Act 1 set in London before Wilde’s trial, conviction and prison sentence for gross indecency and Act 2 set in Naples after Wilde’s has served his term. Each act represents a turning point in Wilde’s life where he is given the chance to save himself from disaster but deliberately does not take it. What makes the play so involving is that Hare lets us see quite clearly what Wilde’s options are and why, for Wilde, as for any tragic figure, the path to self-destruction is the only one he can take. In Act 1 it is 1895 and Wilde had begun a private prosecution of the Marquess of Queensberry for libel, the Marquess having called Wilde a “sodomite”. Wilde had been in a relationship with the Marquess’s son Lord Alfred Douglas (Charlie Rowe), known as “Bosie”, since 1893. If Queensberry’s lawyers could prove that Wilde was an active homosexual, Wilde would be arrested for “gross indecency”, put on trial and, if convicted be sentenced to hard labour in prison. The play begins with a bit of comedy when a hotel major domo (Alister Cameron) catches a footman (Elliot Balchin) in flagrante delicto with a maid (Jessie Hills) in Wilde’s hotel room. With the arrival of the arrival of Robbie Ross (Cal MacAninch), the man who was Wilde’s first male lover and who remained his most loyal friend, a sense of urgency begins to build right to the end of the act. Toronto audiences should know that Ross (1869-1918) was Canadian, remained a friend not just of Wilde, but of Wilde’s wife Constance and her two sons and eventually became Wilde’s literary executor after Wilde’s death and the editor of the first edition of Wilde’s collected works. Ross urges Wilde to flee that night to France because of the absolute certainty that Queensberry will prove his case and Wilde will be arrested. Bosie, however, wants Wilde to stay since he is convinced that his friends in parliament can get the case stopped. Ross counters that Wilde has allowed himself to get caught up in the ongoing dispute between Queensberry and his son and that Wilde, an Irish writer, will be forced to pay the price for their relationship, but never an English lord like Bosie. Despite Ross’s increasingly impassioned appeals, Wilde decides to dine and sleep in his room and do nothing, quipping, “You know that I have always been indisposed toward action”. Hare makes the reasons for Wilde’s decision quite clear. If Wilde were to flee, it would be seen as an admission of guilt, tarnish his name and accomplish nothing. If, however, he were to be arrested and stand trial, the government and the British public would be forced to confront a subject, namely the fact of homosexual love, that they would much more happily ignore. In Act 2 it is 1897 and Wilde, out of prison and looking much the worse, has accepted Bosie’s invitation to stay with him in Naples. The act begins in parallel to Act 1 with a couple in bed, this time post flagrante delicto. It is Bosie with a local fisherman (Tom Colley) while Wilde is in the same room. Bosie has gambled away his inheritance and now he and Wilde have nothing to live on. Ross arrives with a message from Constance that she will divorce him and cut off his small allowance unless he leaves Bosie. Again Wilde, despite Ross’s protestations, refuses to do anything. The question soon becomes whether Bosie and Wilde are prepared undertake the romantic but impossible task of living only on love. Director Neil Armfield has chosen an ideal cast for the production. Rupert Everett plays Wilde as if the role had been written for him. Everett’s slightest gesture, pause or change of intonation is laden with meaning. He has the gift of the greatest British actor of being able to invest even the most trivial lines with subtext. In Act 1 much fuss is made by the hotel staff and Wilde’s friends whether he will or will not have dinner before leaving for the train to exile. Wilde’s delaying of his decisions and his finally choosing to dine may all appear unimportant except that Everett shows us they are all part of Wilde’s wrestling with the choice of two evils that he has before him. His finally deciding to dine is equivalent to his choosing the path of martyrdom. 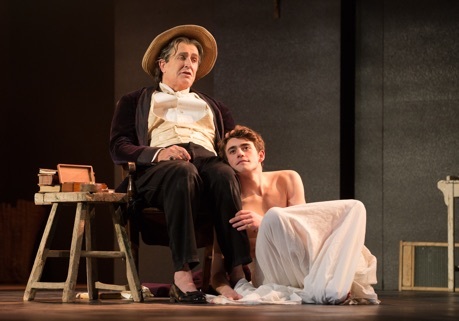 When Everett interacts with Charlie Rowe as Bosie in Act 1, we see the strength of the infatuation on Wilde’s part and his hopeless wish to change Bosie’s protestations of love into the real thing. In Act 2 Everett makes clear through the irony that creeps into his voice that Wilde has finally seen through Bosie along with the infinite sadness that that truth entails. For his part, Charlie Rowe is a fine Bosie. 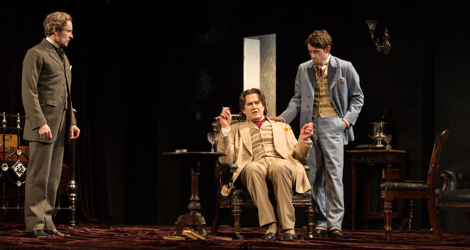 Rowe gives Bosie enough dash and flair that we can see while Wilde should be attracted to him, yet Rowe is able to taint Bosie’ pleas about what is best for Wilde with more than a hint of self-interest. In Act 1 Rowe shows that Bosie is simply unable to face the truth of what will happen. By Act 2 Rowe shows that things have significantly cooled between the two and that Bosie regards Wilde more an an aged relative than as the love of his life. Rowe beautifully delivers the horribly damning speech Hare has written for Bosie where Bosie is willing to lie as much to himself as to Wilde to get himself out of an unpleasant situation. Counter to the egocentric stance of Bosie is the realistic stance of Ross. Cal MacAninch, whom PBS viewers will know best as the waspish Mr. Thackeray in Mr. Selfridge, gives an exceptional performance as Ross. Ross’s thoughts are all about how Wilde can save himself, but he fails to see that Wilde has no interest in self-preservation. MacAninch plays Ross as a man who keeps his feelings tightly bottled up and who tries to present Wilde means of saving himself as the most logical actions to take. Yet, beneath all this logic, MacAninch conveys Ross’s continuing love for Wilde and his persistent bewilderment at having been thrown over for a less loyal lover like Bosie. Eventually, when all arguments fail, Ross has to state these feelings outright, knowing, as MacAninch demonstrates so well, that they will have no effect. The other four roles are minor compared to these three. Alister Cameron, Elliot Balchin and Jessie Hills all do well in their roles, with Cameron hinting simply through his inflection that the major domo may have his own peculiar tastes involving the footman. As Galileo the Italian fisherman, Tom Colley really has to do nothing but speak Italian and look gorgeous completely naked, both of which he accomplishes effortlessly. Dale Ferguson’s set looks less like a room at the exclusive Cadogan Hotel than a dark grey prison cell with Victorian furniture. Perhaps that is the desired effect, but the set when modified for Act 2 looks much more realistic as a room in a crumbling Italian villa. Rick Fisher’s lighting is especially noteworthy for an unusual effect he uses to show the passage of time in each act. A spotlight above the stage shines first on Everett, then slowly turns to illuminate significant objects on stage before returning where it started like someone surveying a room before leaving it forever. Too many plays about famous artists merely accumulate trivia about the artist without providing any insight into the person. The Judas Kiss is remarkable for tackling the central question about Oscar Wilde head-on – namely, why would a man at the height of his creative powers apparently court his own destruction? While the play does not explain why Wilde should have initiated the libel suit against Queensberry, it does explain better than any other play or film why he dealt with the consequences as he did. For any lover of the theatre and superlative acting, The Judas Kiss is a must-see. Photos: (from top) Cal MacAninch, Rupert Everett and Charlie Rowe; Rupert Everett and Charlie Rowe. ©2016 Cylla von Tiedemann. For tickets, visit www.mirvish.com or www.bam.org.